So the busy hasn’t stopped, it has been another mad week – they just seem to fly by at the moment, I can hardly believe it is Saturday again. My birthday was lovely last weekend – we caught up with people, I was given a lot of chocolate (seriously, all my presents except one involved chocolate) and we ate a lot. The Gethin-dude stayed over, which was fun as always. Then I had Monday off work to relax (which didn’t really happen, but never mind). 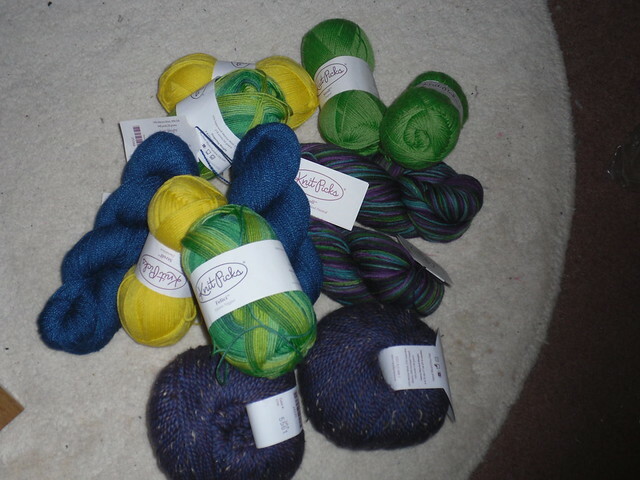 That’s an assortment of sock, lace and heavy worsted weight yarn in some interesting colours. I can hardly wait to try some of it out, but I really should finish some of the stuff I already have on the go first! Speaking of which…the lightweight sockyarn blanket is now on hold, having made good progress lately. The forest path stole is still on hold. The green stole, which is coming along nicely, has gone into temporary hibernation. The blanket I started for Muffin is nearly finished but has slowed right down. In fact, the only thing making any progress at all really is the pair of socks for Morgan’s xmas present. I have started and restarted them at least 4 times now, trying to find the right pattern. The problem is that the pretty, delicate, intricate patterns I was trying to use were just too complicated. I don’t have the attention to spare in the evenings, which is about the only time I get for knitting these days, so I make a lot of mistakes. I did settle in a slightly less complicated pattern, then realised halfway down the leg that they weren’t big enough. I have now gone back to a pattern I have made before – one of my favourites in fact. Sock #1 is down to the foot, so it shouldn’t take long to finish them. This week coming…I have a check-up at the dentist and an appointment with the doctor. I have work as usual, including the Bristol thing. This afternoon we’re taking Madi shopping for her birthday present. We also have to buy and send something for a nephew’s birthday. Next weekend we’re going to Alan and Kat’s for dinner. This entry was posted on November 19, 2011 at 10:59 am and is filed under knitting. You can follow any responses to this entry through the RSS 2.0 feed. You can leave a response, or trackback from your own site.